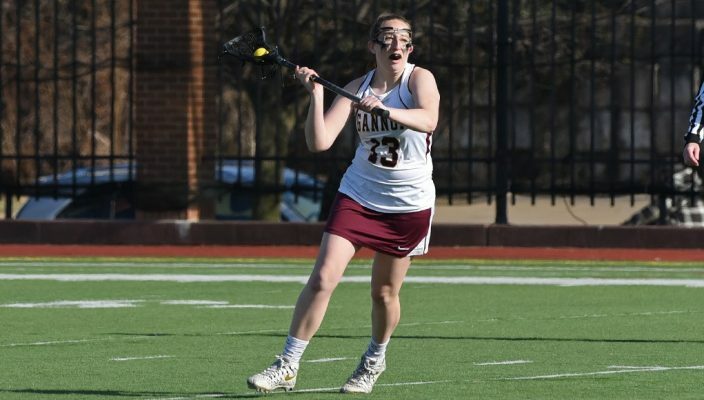 Erin Rotondo scored nine goals in two games for Gannon University’s women’s lacrosse team last week, but the Knights dropped both of those outings, 10-7, to Edinboro on March 27 and 15-9 to host Kutztown on Saturday. In addition to last week’s action, the Knights battled rival Mercyhurst on the road Tuesday and lost, 16-4, dropping their record to 2-7. In the March 27 matchup with Edinboro at McConnell Family Stadium, the Fighting Scots (1-7 overall, 1-3 in PSAC play) got on top of Gannon early with a goal just 1 minute, 26 seconds into the contest. After Edinboro built its lead to 4-1, the Knights rattled off three goals in a row. A save by goalie Erin Renwick sparked a Gannon march down the field, one in which Rotondo would score her first goal of the game. This goal made it 4-2 in favor of the visitors. Kayla Shields and Jamie Briggs then netted two goals in a row for the home team to tie the score at 4-4. After six total minutes without a goal, the last four of the first half and first two of the second, Rachel Tufts gave Gannon its first lead of the game, 5-4, on a free position shot. A Gannon turnover allowed Edinboro to tie the game up at 5-5 on the next possession. The Fighting Scots then took control of the game, scoring two goals in a 50-second span. Rotondo tried to keep the Knights in the game with a goal of her own to make the score 7-6. However, Edinboro would pull away even more with two quick goals to make it 9-6. Rotondo added one more goal at the end of the game, but it was not enough. Rotondo scored five goals against Kutztown on Sunday, but again it could not bring Gannon a win. Kutztown (4-4 overall, 3-2 in PSAC play) heavily outshot Gannon in this matchup, 40-20. Kutztown also controlled the draws at a better rate than Gannon, winning that battle, 18-8. Rotondo scored the first goal of the game for the Knights, assisted by Shields. This goal made it 1-1. The hosts would then go on a tear, scoring four in a row, to give themselves a 5-1 lead. Two straight goals later in the first half from Tufts and Shields brought the visitors back to within striking distance, down 5-3. However, Kutztown found the back of the net three times in a row to head into the break with momentum and an 8-3 lead. The Golden Bears scored another three goals in a row early in the second half to take an 11-3 lead. However, the Knights weren’t to be counted out just yet, going on a run for themselves. Rotondo netted three goals and Alexa Bower scored once to make the score 11-7. The second-half run from Gannon ended up not being enough, though, as the Knights fell. Following Tuesday’s matchup with Mercyhurst, Gannon will host West Chester at 11 a.m. Saturday at McConnell Family Stadium.